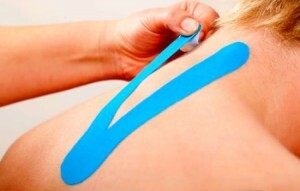 Kinesio® Taping Method involves utilizing a special elastic-like tape over and around muscles and/or joints in order to assist and give support to affected tissues as well as to prevent over-contraction. Basically, there are times when the muscles are in spasm (too tight) or too weak and applying the tape to these areas can make patients feel immediately better. It can also be applied to support a joint, tendon, or ligament — all in the name of pain relief. While most people think of tape as a restrictor of motion, this type is designed to support and facilitate normal motion. With this method the patient can still be a full participant in the activities which he or she desires, just with a bit of aid. Just ask Olympic, professional, collegiate, and amateur athletes of all sports how helpful it can be! Our doctors are fully trained in this cutting edge method making us one of the few clinics in the Mid-Atlantic to offer this service in such an original and effective capacity.